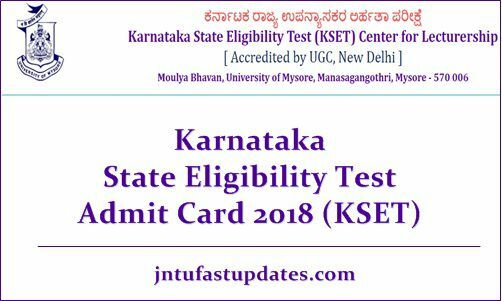 KSET Admit Card 2018: The University of Mysore, Mysore has scheduled to conduct the Karnataka State Eligibility Test (KSET) examination on 30th December. Aspirants applied for the KSET 2018, can hurry up to download Karnataka SET admit card from the official portal, kset.uni-mysore.ac.in. This examination will be attempted by a large number of applicants. And the conducting authority is going to organize the test in many examination centers across the Karnataka state. Candidates applied for Karnataka State Eligibility test can check their examination venue details from their respective hall tickets. To attend the test, candidates have to download KSET Admit card. The examination officers are going to verify the admit cards of aspirants before allowing them to the examination. Hence all the hopefuls are advised to carry the admit cards as a must while going to the examination. Applicants competing for KSET examination can check the hall ticket availability date, downloading instructions and other details from the following. The University of Mysore, Mysore has issued the official notification for Assistant Professor Vacancies recently. Recently, in the months of October-November, the Karnataka SET Application process was completed. A huge number of aspirants having the suitable eligibility criteria have applied for the assistant professor/lecturer posts. The screening of the candidates will be done through the written test and interview rounds. Candidates applied for the Assistant Professor jobs need to clear the Karnataka State Eligibility Test to qualify for the interview round. Karnataka SET examination for Paper 1 and Paper 2 will be organized by the conducting authority. Candidates have to qualify each round to get shortlisted for the next round. Finally, aspirants qualifying in all the rounds will get the chance to work as an assistant professor in the state of Karnataka. All the applicants enrolled for the Karnataka State Eligibility Test examination can download KSET Hall ticket 2018 from the University of Mysore KSET official website, kset.uni-mysore.ac.in. The hall ticket will be available before 10 days of the examination (approximately). Hence the applicants can get ready to download the admit card when the link activated on KSET Website. The University of Mysore will notify the accurate hall ticket availability date on its official website. Hopefuls can stay checking the portal for more updates. And many other details, examination guidelines. Check the hall tickets carefully after downloading them. If any of the printing mistakes appear in any column, the applicants can make a complaint about necessary corrections on it. The competitors are hereby informed to carry the admit cards as a must to the examination. If any of the candidates fails to show the admit card, he/she will not be allowed to attend the test. Hence remember to carry the hall tickets while leaving to the examination. Along with the admit cards, candidates have to carry any of the valid identity proof copy for verification purpose. The applicants can carry any of the following documents. Or any other valid document. Search the KSET Hall Ticket download link in organization website. Check the information in Karnataka SET Hall Ticket 2018.